Our history was initiated in the summer of 1953, when Rome F. Schwagel, a member of the Keedysville Club met with residents of Burkittsville to describe what Ruritan’s mission was in hopes of forming a new club. 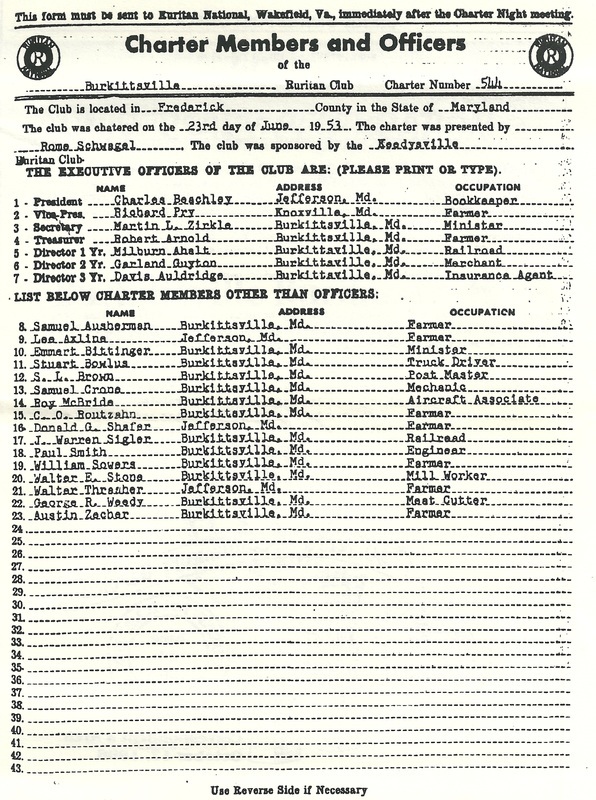 His efforts were successful and on Tuesday, June 23, 1953, 23 members of the community signed a charter, formally organizing the Burkittsville Ruritan Club. In its first years of existence, the club met in the Parish Hall of Saint Paul’s Evangelical Lutheran Church in Burkittsville, and events such as butcherings and community breakfasts soon began to occur as ways to bring the community together and raise money for the club to distribute to those in need. In 1961, the club began holding a Town Fair in the summer, setting up games and serving food on the ballfields to the west of the town school. Later renamed the Carnival, this event continues to the present each summer. In 1969, the club purchased the old Burkittsville Elementary School, which was sold at public auction after the Board of Education closed the school amid redistricting in the area. Work began to rehabilitate the 56 year old structure into a community hall. The two classrooms and principal’s office at the rear of the building were combined to form the meeting hall, and the cafeteria was made into a large kitchen. Part of the third classroom at the front of the building was turned into a storage space, while the remainder was preserved in its original layout. The result was a commodious meeting space and a well equipped center for community events and private get-togethers. Today, the hall is rented for receptions, picnics, parties, and other events, and the basement of the hall is rented to the Municipality of Burkittsville for town offices. Our club charter, signed by the first twenty three members on Tuesday, June 23, 1953.